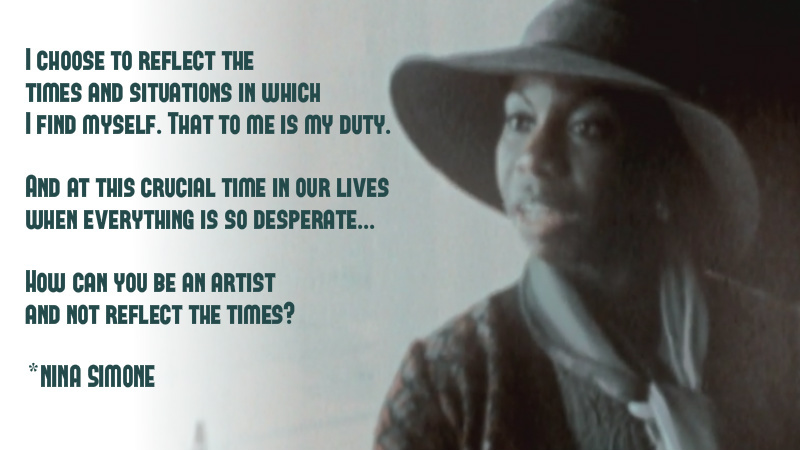 Last weekend I watched Netflix’s first original documentary “What Happened Miss Simone?” by director Liz Garbus about the life and art of “the high priestess of soul” Nina Simone. As an ex-Lindy Hopping lover of jazz, documentary filmmaker, this movie had my name written all over it. Being such a fan of swing and jazz, I was already familiar with popular hits by Nina (like “My Baby Just Cares for Me,” “Feeling Good” and “I Put a Spell On You”) and many others. But my knowledge of her was superficial. I never knew she at one time was on track to be the first African-American woman and break-out star classical pianist. (In fact, she got into singing sort of by accident. It definitely was not her plan). Nor, ashamedly, did I know the huge role she played in the civil rights movement of the 60s. In fact, it was her role in that movement, and the songs she wrote for its cause (like “Mississippi Goddam” and “To Be Young, Gifted and Black”), that contributed to the dip in her fame and career. I won’t spoil what happened after that if you haven’t seen the movie. It’s streaming on Netflix now, so check it out. Here comments are a powerful challenge for artists. Whether you’re a filmmaker, photographer, musician, writer, painter, what have you. Do you feel the call to use your art, at some level, to make a difference in this world? To reflect the challenges of the day? There’s no judgment here. Just a question worth pondering. Yes, yes, absolutely yes! I actually felt the calling first to tell stories that would make a difference in the world. Then I somehow ended up doing that through the medium of video. Thanks for this post, hope I can make time to watch the doc! You will be moved Katie. It’s quite a story. Do u remember the 8track Mom had of Nina? Nina’s rendition of “Porgy and Bess”, PURE BEAUTY. I tear up every time I hear it and she sings “I love you Porgeeeee, don’t let th take me…” A true capture of the pain of separation. And Ron, u may not remember at Omawalee Ujama, U.S. , singing “TO BE YOUNG GIFTED AND BLACK”~ good points about be relevant to the language of the times. Here comments are a powerful challenge for artists. Whether you’re a filmmaker, photographer, musician, writer, painter, what have you. Do you feel the call to use your art, at some level, to make a difference in this world? To reflect the challenges of the day? There’s no judgment here. Just a question worth pondering. – Love Her !